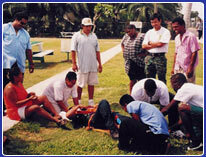 Purpose: To provide qualified, equipped ambulance service to the country of Belize. Mr. and Mrs. Wagner became involved in Belize since the early 90’s assisting Belize through the Wings of Hope Air Ambulance Service. Wings of Hope service in Belize always had a Belize City Rotary Club affiliation.